Gluten Free Maple-Oat Cookies & Vegan MoFo 2012. It’s here. The vegan month-0f-food has arrived again. Last year was my first year participating. I did well the first week and a half and then lost a lil of my fire. Let’s see if I can help that this time around! Another delicious recipe seen on Eat the Love that needed some veganizing. 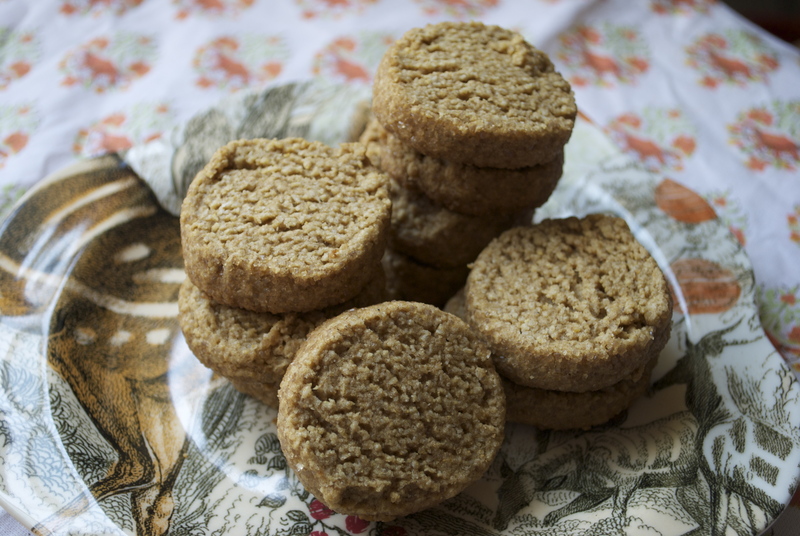 They are referred to as shortbread on Irvin’s blog, but my cookies were something else. Almost shortbread, but not too buttery. They have a really nice crumb and texture and the flavors are delicious, but subtle. I decided to omit the cherries because I just felt like I wanted maple-y goodness in its pure form. Trader Joe’s has been selling small packs of organic maple sugar on the cheap, which is awesome. Maple sugar has set me back almost $11 in the past for a pretty small quantity so I really never used it that often. When I saw it all cheap-like at TJ’s, I knew I had to buy a bunch and it would eventually get used in some treatage. Total treatage. Then Irvin, who I swear reads my mind, made up these little maple goodies. Okay, so first we start by subbing out butter for equal part Earth Balance or your favorite non-dairy, non-hydrogenated buttery spread margarine product. Then omit the salt because our good pal Earth Balance has enough salt to cover us. When you reach the part of the recipe that call for an egg, an a tsp of Ener-G egg replacer dry….also known as don’t whip it with water like the box tells you two. At that point, I added about a tsp of 100% pure grade B maple syrup. That’s it. It’s that easy. Follow the rest of the given instructions and in the end, you can invite all of the poor wayward souls that cannot eat glutens over and you can all rejoice in delicious gluten free fall cookie splendor. ← Nectarine Elderflower Pie w/ a Hint of White Pepper. Oh, thejollyfox, how I have missed your lovely blog! September did not treat me kindly for a lot of reasons, so I stopped blogging and reading others’ blogs. I’ve missed you and several others. Glad you’re doing MoFo too – thanks for the tips on the cookies. My dad loves little shortbread/sandie cookies like these. So glad you are back! And so sorry September turned out the be a jerk this year! I have to agree with you there. Also, you must be reading my mind because I attempted apple-walnut blondies last night! Love apples, wlanut, maple together.The blondies need another go though. Not a total failure, but they need work. In the meantime, I will be headed over to your blog to check out that appley-maple sugar-walnut crisp goodness! Yay! Sorry your September sucked too, but it sounds like you made the absolute right decision around the surgery. So happy you have that clarity. Please please please post the blondie recipe when you perfect it. Sadly I was not able to get the crisp recipe up! I spent Tuesday night in the ER with a sick family member and have been in and out of the hospital since then. Just made a post about it – will be doing the apple crisp later this week. It’s Myra Kornfeld’s recipe, if you already have The Voluptuous Vegan! Yum-A! You had me at maple. To prevent myself from burning out this year, I decided to take weekends off. I made it through the entire month last year but the second it was over I never wanted to blog again. So heres hoping some breaks do me some good. You are so smart. I think I may need to do the same! I forget how time consuming blogging can be–even when I have what I think is a short, simple recipe, I realize I take forever to type things out!